The new counter features seating area for passengers, a new concept introduced to other counters currently found inside Terminal 1. The new concept will provide a relaxing and comfortable atmosphere to a significant number of arriving and departing passengers who are waiting for their rented cars or those returning the vehicles. 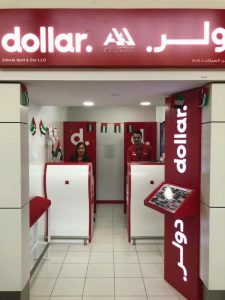 Dollar covers UAE with branches in Abu Dhabi, Dubai, Al Ain and Sharjah. Dubai alone has 16 branches, three of them serving round the clock at Dubai International Airport Terminals 1,2 and 3.